As the holidays loom ahead, more and more talk of turkeys will crop up and usually in terms of meat (although there is an increasing number of vegetarian options like The New York Times’ Well’s Vegetarian Thanksgiving). 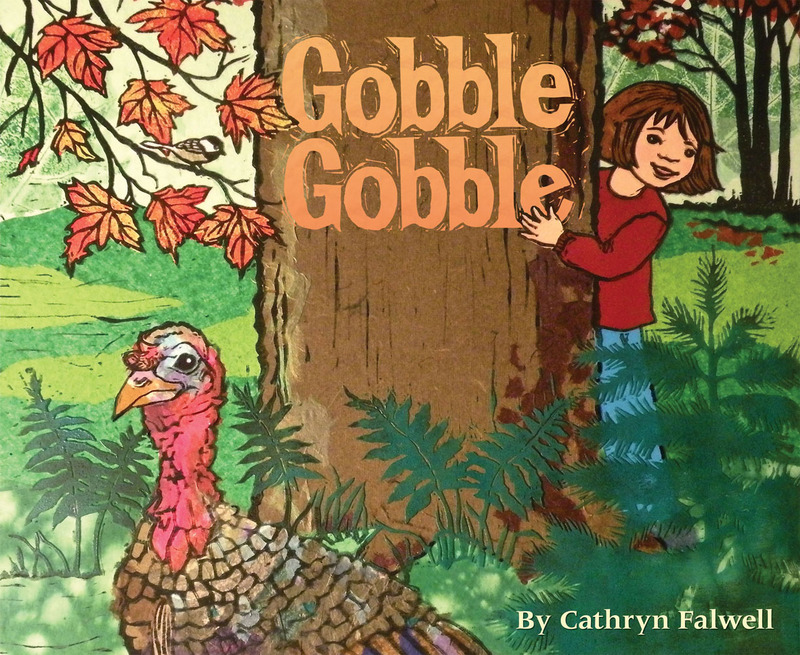 It is especially lovely to find gems like Gobble Gobble which focuses on turkeys as interesting animals with unique traits rather than a traditional holiday specialty: stuffed, roasted carcass. Although Gobble Gobble is primarily about wild turkeys, it emphasizes the way turkeys are originally meant to be rather than the flightless, over-bred, overweight domestic turkeys found on factory and smaller farms. Similar to Jo MacDonald Saw a Pond, Gobble Gobble has an observant, young naturalist modeling respect for wildlife. Jenny is a young girl who is lucky enough to live where wild turkeys wander through her yard. With each season, she describes their antics and imparts more information about wild turkeys. My daughter and I loved how expressive and detailed the turkey illustrations were and some pages made us laugh out loud. 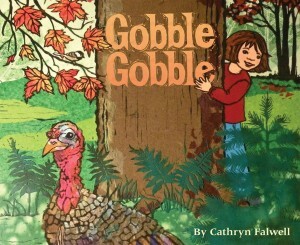 Author and illustrator Cathryn Falwell, uses block printing, paint, and collage techniques for her colorful illustrations. The rhymes are cute, without feeling forced, and the name of each season is written in a different color. At the back are several pages with additional information and history about wild turkeys and their domestic counterparts, explanations of a turkey snood (the red doohickey on the head) and caruncle (bumpy skin around the head area), and terms like tom or gobbler (male), poult (baby turkey), jake (young male), and jenny (young female). There are also some suggested activities for kids and an animal print identification activity. One of my favorite lines in the story is, “The year is coming to an end. Turkeys know that I’m their friend.” It gives me hope that characters like Jenny (and even Swedish Chef!) can model kindness towards birds so children know that turkeys and other birds are animal friends, not a holiday meal. Hopefully, this year many folks will befriend a domestic turkey by either adopting a turkey at a local farm sanctuary, attending a vegan thanksgiving event, and/or making several of many delicious vegan Thanksgiving recipes (Nava Atlas has a new Vegan Holiday Kitchen cookbook out!) to introduce to family and friends. I am honored to read this lovely review. Thanks so much! I read this one too!